If you’ve driven in Michigan within the last few weeks, there’s a decent chance you’ve seen a pothole. Actually, lots of potholes. With the rise in temperatures and the heavy rain that has drenched the state, frozen roads are warming up, snow is melting and riverbeds are overflowing onto roads and sidewalks. This is a huge concern for motorists and county road agencies statewide as roads with potholes proliferate. “When the roads start thawing, particularly with the amount of rain that happened, that’s the time in which the roads are most vulnerable,” said Denise Donohue, director of the County Road Association of Michigan. As of Feb. 23, 47 of the state’s 83 counties have activated full or partial seasonal weight restrictions to preserve designated roads with axle-loading limits and slower maximum speeds. Zach Russell, the communications administrator for the Ottawa County Road Commission, said that over the last few days, the number of reports the agency has received has forced the road commission’s supervisors to focus solely on potholes. Despite the amount of resources being put into road repair, Russell said it’s difficult r to compare this season to previous ones because of the uncertainty of what March will hold. “If March has a lot more thawing and freezing, it can cause problems, too. Even if it’s not more extreme weather than we’ve had in past years,” he said, roads are getting close to the end of their usable life..
Officials in some counties, however, are bracing for this season to be worse than normal. During weeks when road problems are at a high, Kizer said Washtenaw County deploys six to eight pothole crews to tend to its roads. According to Cindy Dingell, the public information manager for the Road Commission for Oakland County, the rapid fluctuation in temperatures have made this season unusual. Dingell said that the county’s last count of pothole reports was just over 900 so far this year, slightly higher than last year. 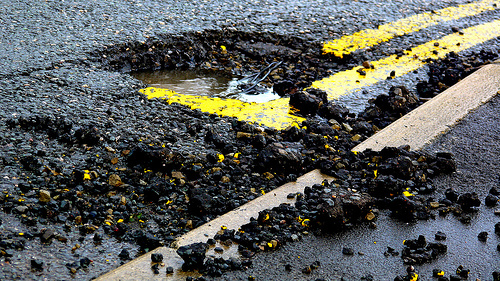 The Lapeer County Road Commission’s board secretary, Linette Weston, said the state’s lack of funding for transportation infrastructure is a challenge all counties face in combating potholes and other maintenance problems. Weston advises motorists to stay alert. “Expect delays and defects as you make your commute. Also be aware that road workers will also be out working to fill the holes and they need space to do their job safely,” she said.